The World Friendship Day was celebrated on July 30. But there isn't a specific date for the Friendship Day as in some countries the Friendship Day was celebrated on August 1. In India the Friendship Day will be celebrated on August 7, 2011. On this day, you could express your care and affection with your friends. You could reminisce the great moments you had with your classmates, college friends and co-workers. The better way you could celebrate the day was sending greeting cards and other gifts to your valuable and unforgettable friends. Be it, friendship sms via the mobile phones or friendship messages, scraps, friendship quotes, friendship greetings on social networking sites on the Internet - everything is gaining in popularity. Feel the essence and worth of true friendship with these golden Friendship Quotes and post it anywhere you want. "A true friend is one who overlooks ur failures and tolerates ur successes. " "Life without friendship is like the sky without sun." "Make new friends, but keep the old. One is silver the other gold." "Some friends are remembered because of their smile. Some friends are remembered because of their style. But u are remembered because u r so nice to remember. Take care. " "I admit I'll never be the perfect friend. I'll never be there always. I may not make u smile at times but there is one thing I admit I could do. To be the person I could be for u." "We are meant to be together and always be near through the good times and bad one Happy Friendship Day." Quite often, people send greeting cards to the friends on the friendship day. It is one of great ways you can keep in mind the memories of your friends as they reach some messages to your friends.Ecards are fastest way to send wishes directly to your friends email account. You can send Ecards from Techravi.com (sponsored by 123greetings) from here. 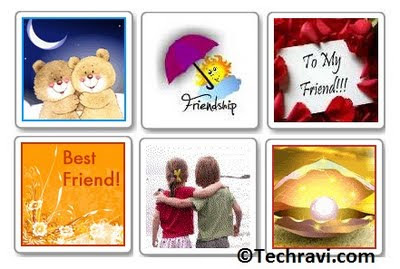 So, Enjoy friendship day with your precious friends and Suggest Techravi to them.